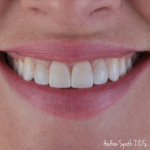 This patient was in a car accident which resulted in the loss of her two front teeth. After 17 years, she finally decided to get her quality of life back and the function of her bite. Over the course of several months and a few different procedures to place the implants, the final result is absolutely stellar! 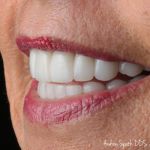 She now has a beautiful, functional, and long-lasting smile.